The Inka Trail between the Sacred Valley of the Urubamba River and the mysterious abandoned citadel of Machu Picchu is one of the world's classic treks. Climbing out of the river valley, crossing rugged mountain passes over 13,000 ft high, the trail winds through the Andes, passing numerous significant Inca ruins en route before descending through the Sun Gate to the silent stone city of Machu Picchu. 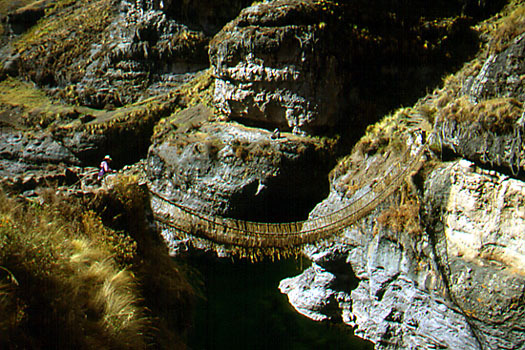 To hike the Inka Trail is a thrilling experience and a very great priviledge. The purpose of this website is to share the thrill and privilege of the trip with those who may not hike it in person, and to help future hikers plan their coming adventure. But the Inka Trail is much more than a great hike. It is one small portion of an incredible network of such trails crossing high stony mountain ranges, bleak deserts, and raging Andean rivers, tying the Inka Empire together. At its peak expansion, Tahuantinsuyo --"The Four Corners", as the empire was known-- extended from what is now southern Columbia in the north, to central Chile in the south, a distance of about 5500 km (3400 mi). 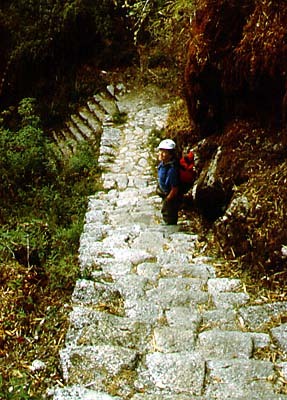 To rule such a vast domain, the emperor, or Inka, forged a remarkable communications system of approximately 30,000 km (18,600 mi) of trails, paved through much its length, stepped where need be, through tunnels where necessary, and using gossamer suspension bridges built of straw ropes to cross rivers unfordable in the wet season. The roads served to move the conquering Inka armies, and were generally wide enough for a minimum of two warriors to travel abreast. A system of runners stationed at rest houses known as tambos sped messages along the roadways, much like the Pony Express mail of the old American West. The Inka in his empire's capital at Cusco could receive news from far away Quito as rapidly as a letter crosses between the two cities in today's mail. Trekkers of the Inka Trail, be it the well-known portion leading to Machu Picchu, or lesser-visited segments, are privileged to make use of an archeological treasure, as well as to partake of scenes of surpassing beauty. Care for the trail: don't abuse it in ways that promote loosening or erosion of the stonework. Care for the beauty of the landscape: don't leave trash or waste behind. And now, the Inka Trail, from the Sacred Valley to Machu Picchu. 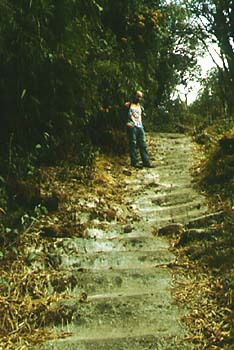 Most Inka Trail treks begin at either Km. 88 on the railroad to Machu Picchu, or the village of Chilca, which lies in the Urubamba Valley downstream from Ollantaytambo, to which it is connected by a dirt road. If beginning at Km 88, you have to take the mixed local train (first class tourist trains do not stop here) and be prepared to jump off quick (even the mixed local doesn't stop long!). Here you cross the Urubamba on a footbridge at about 2200 m (7200 ft) and pay your Inka Trail entry fee ($50) to the custodian. The trail turns back to the left and heads for the ruin known as Llactapata; there is a 1 km long side trail off to the right that will take you to a little visited ruin known as Q'ente (translated as "hummingbird"). 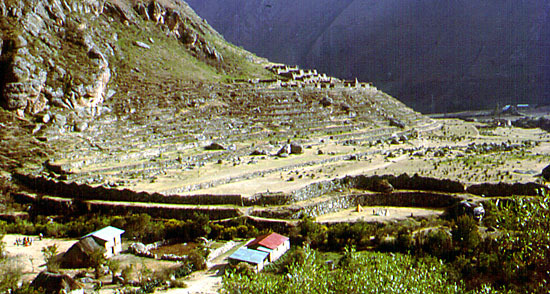 If beginning at Chilca, the trail, which here is an unpaved trail of possibly Inka or post-Inka origin, follows along the left bank of the Urubamba gorge, with views across the river of terraced farmland, snow-capped mountains, a glacial valley with a beautiful example of a terminal moraine, and a small, inhabited Inca ruin. For much of the nine kilometers from Chilca to Llactapata the rail line is also in sight on the opposite side of the river, and you may see the red and yellow coaches (or blue, in their newer livery) of the train rock by. 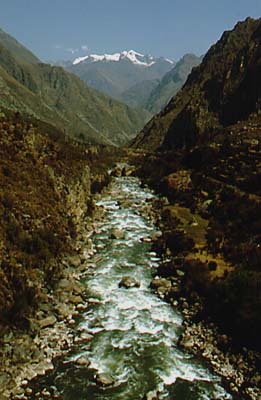 From Llactapata the trail turns south, away from the Urubamba and up the valley of the Río Cusichacha, a small stream scarcely deserving the appellation "river". 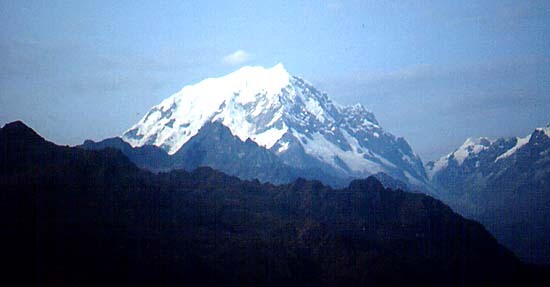 Trekkers starting from Km 88 will probably continue past Llactapata up the Cusichacha about seven km to its junction with the Río Llullucha, where the trail turns west and follows the Llullucha. 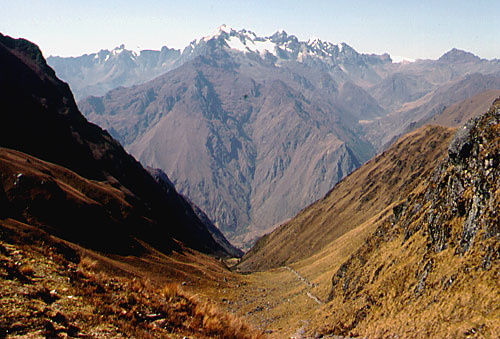 Just above the junction of the two streams is the village of Huayllabamba ("grassy plain", the only inhabited village on the Inka Trail). Beyond this village are three regular campsites along the Río Llullucha. The first of these is "Three White Stones" and is only about a half-hour walk from Huayllabamba. The next campsite, Llulluchapampa, is significantly higher up the trail, and colder, but features toilets. A third and final campsite on this side of the first high pass is yet another 20 minutes or half hour further up the trail. Any one of these campsites makes a good overnight rest stop for trekkers starting from Km. 88. 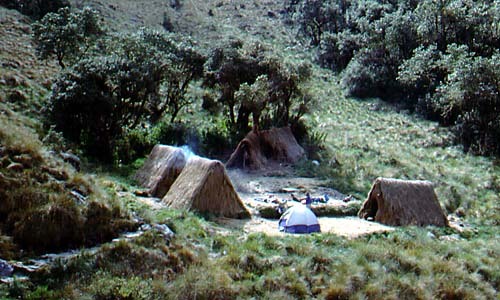 Llulluchapampa camp is about 11 km from Llactapata. From the campsites in the Llullucha valley, the Inka Trail struggles up above the tree line to cross the first and highest of the mountain passes between Llactapata and Machu Picchu. At Huarmiwañusqa, more popularly known as "Dead Woman Pass", the trail reaches an elevation of 4198 m (13,772 ft). It's a heart-pounder for most, but the reward is a stunning view back down the Llullucha valley to snow-capped mountains in the distance, and a preview of the ups and downs ahead on the trail to Runkurakay. 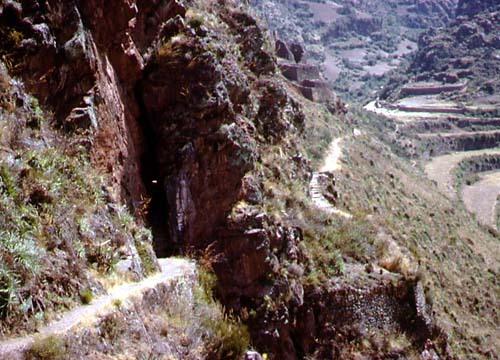 From Dead Woman Pass the descent to the small stream known as the Río Pacamayo requires an hour or more. 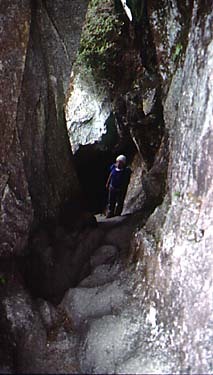 A short distance below the pass the trail passes through the first tunnel, under and between giant boulders. From the Río Pacamayo a new ascent ensues, which brings one to the small ruin of Runkurakay. This name, translated variously as "oval hut" or "egg hut" is the smallest and most enigmatic of the ruins along the hike. Perhaps it was a watchtower? Or perhaps a small tambo for messenger relays. In any case, hard by the ruin is a pleasant campsite. The distance from Llulluchapampa to Runkurakay is only about six km, but getting up and over the pass is strenuous. 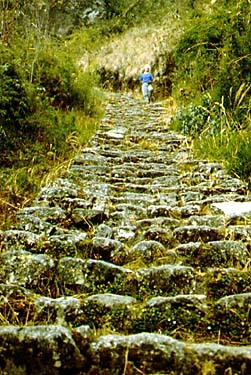 Just above Runkurakay, the Inka Trail becomes paved with stones and assumes the more engineered nature for which it is justly famed, and which characterizes it from here to Machu Picchu. A short hike beyond Runkurakay ruin brings one to the pass of the same name, at 3998 m (13,116 ft), and after another hour's downhill hike one arrives at the ruin of Sayacmarca ("dominant town"). This fort-like ruin lies to the left of the trail and must be reached by a climb up 98 steep stone steps. The town or fort is built on a mountain spur and commands fine views. From near Sayacmarca the paved trail can be seen stretching away into the distance. 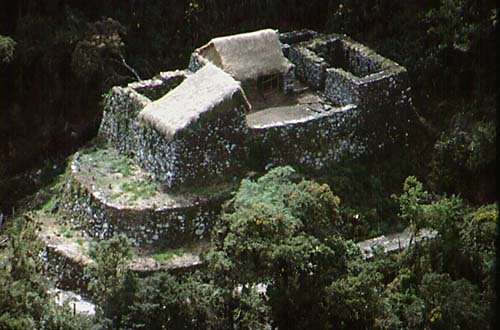 A short distance along the trail below Sayacmarca is another much smaller ruin and possible camping area. 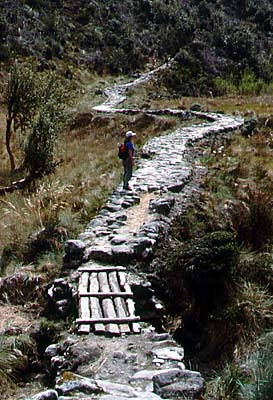 In the stretch of Inka Trail between Sayacmarca and the next major ruin, Phuyupatamarca, trekkers will find some of the most impressive Inka trail engineering. Along one section the trail passes through a boggy area as a raised causeway. At another point it passes through a hewn tunnel, and at yet another point stones were set in notches cut in a cliff face to build up a surface wide enough to walk along where none existed naturally. This section of the trail also features some of the most interesting exotic vegetation seen on the trek, and at one point, an awesome view back down to the Río Urubamba in its winding gorge. After passing through the third pass (4000 m, 13,125 ft) and some of the wildest rugged scenery imaginable, the trail reaches Phuyupatamarca ("town above the clouds"), approximately nine km and two- to three hours hike from Sayacmarca. 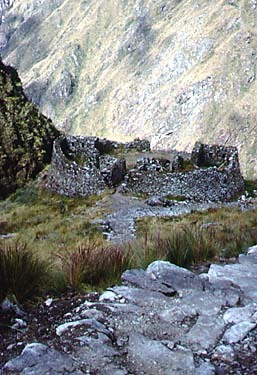 The ruin is reached by descending a long flight of stairs, and near the entry the trekker finds a series of six flowing liturgical fountains or "baths", illustrating the Incas' love of sparkling, splashing water and engineering ability to play with it. Near Phuyupatamarca is a popular campsite, and if the weather is clear, from a ridgecrest above the ruin a spectacular view can be had of mighty Salcantay (6271 m, 20,694 ft), a sacred mountain to the Inkas. Altogether, the town above the clouds is a most intriguing site. The remaining distance to Machu Picchu is around ten km, including a short side trip to Wiñay Wayna ruins, and mainly downhill, dropping from around 3650 m (11,975 ft) to a mere 2400 m (7875 ft) at Machu Picchu. The change in vegetation from alpine bunchgrass to relatively densely forested mountainsides is dramatic. Leaving Phuyupatamarca the Inka Trail descends an unbelievably long series of winding steps, many cut into the living rock. 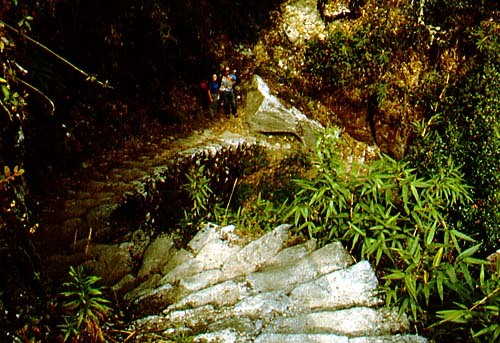 Amazingly enough, this section of the trail was only discovered a few years ago, and opened to trekkers in 1985; formerly, hikers followed a section of non-Inca trail between Phuyupatamarca and Wiñay Wayna. One has to wonder what unknown archeological treasures remain hidden in the underbrush. After a two to two-and-a-half hour hike, the somewhat surprisingly located and intrusive Trekker Hotel is reached. Beds, floorspace for sleeping bags, hot showers, meals and drinks may be had here. And here a side trail takes off a half a kilometer to Wiñay Wayna ("forever young", named after an orchid species). This lovely ruin is considered by some to be more beautiful than Machu Picchu, if not as dramatic. It consists of an upper ceremonial section, and a lower living section, connected by a long set of steps paralleling a beautiful series of ten liturgical fountains. Both sections are flanked by an enormous sweeping ampitheatre of agricultural terraces, and the entire scene is set off by a waterfall in the forested backdrop. This site alone would justify the entire Inka Trail hike (if it needed justifying)! From the Trekker Hotel, a two hour hike, the trail passing through densely forested mountain slopes, brings one to the Intipunku or Sun Gate, and a first, unforgettable view of the ultimate goal: Machu Picchu. 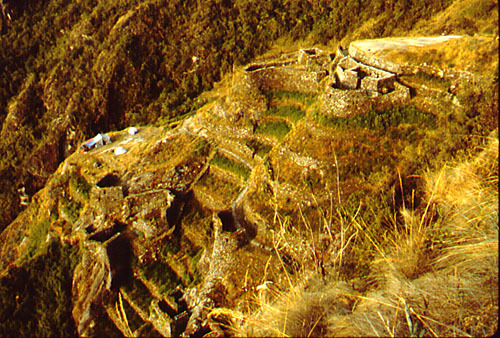 And from here it is just a 30 minute hike along the broad, flagstone-paved trail to reach the Watchman's Hut in the upper part of the Machu Picchu's Agricultural Sector. But savor the shifting panoramas as you hike this final segment of the Inca Trail: the shear bromeliad-studded cliffs to the right of the trail; what look like toy trains and tracks far below in the sinuous gorge of the Urubamba; the drama of Huayna Picchu peak rising like a stone juggernaut out of Pachamama's breast; and the mysterious grey stone city mounted like a gem in a setting of cliffs and canyons. There is no other place comparable! The number of hikers allowed to trek the Inka Trail is strictly regulated, and space is limited. 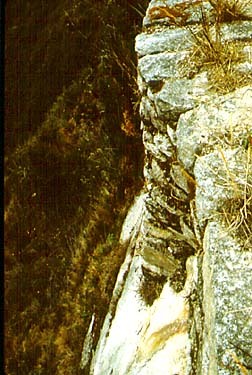 For this reason, most outfitters supplying Inka Trail trek services require reservations more than a month in advance. Inka Trail permits are issued for each individual trekker by name, and must be obtained at least 30 days before the day the trek commences. To enjoy the Inka Trail to the fullest, you should allow four days for the trek. Shorter treks are possible, but not ideal. THE INSTITUTO NACIONAL DE CULTURA (INC) IS IN CHARGE OF THE ADMINISTRATION OF THE INKA TRAIL AND SETS THE RULES. 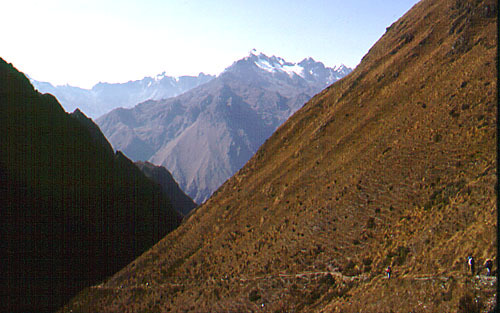 THE NUMBER OF USERS ON THE INKA TRAIL IS RESTRICTED BY LIMITING TRAIL ENTRY TO 500 PER DAY. THIS FIGURE INCLUDES VISITING TREKKERS AND THE SUPPORT PERSONNEL (GUIDES, COOKS, & PORTERS). INASMUCH AS SUPPORT PERSONNEL OUTNUMBER THE VISITORS, THE ACTUAL NUMBER OF ENTRY PERMITS AVAILABLE FOR VISITORS IS LESS THAN 250 PER DAY. THE COST OF THE INKA TRAIL ENTRY PERMIT IS $88 FOR THE FULL INKA TRAIL; THIS INCLUDES ENTRY TO MACHU PICCHU PROPER. 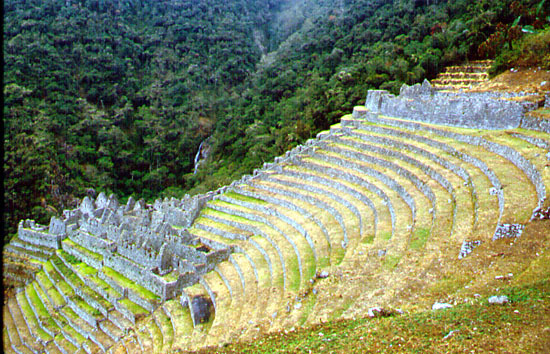 FOR A ONE-DAY HIKE FROM KM 104 TO MACHU PICCHU VIA WIÑAY WAYNA THE ENTRY FEE IS $55. INKA TRAIL PERMITS ARE PERSONAL, i.e., ISSUED TO INDIVIDUALS. THEY ARE NON-REFUNDABLE, CANNOT BE MODIFIED ONCE BOOKED, AND CANNOT BE TRANSFERRED TO ANOTHER VISITOR. 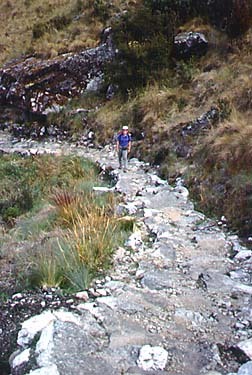 THE INKA TRAIL PERMIT IS ONLY GOOD FOR FOUR DAYS OF TRAIL USE. FIVE DAY TREKS ARE NO LONGER ALLOWED. N.B.! DEMAND FOR INKA TRAIL TREK PERMITS IS NOW HIGH THROUGHOUT THE YEAR. THIS IS ESPECIALLY TRUE OF THE MONTHS JUNE - SEPT. WHEN DEMAND FOR TREK PERMITS REGULARLY EXCEEDS THE NUMBER OF SPACES AVAILABLE. YOU NEED TO BOOK EARLY. Example: As of July 11, 2005, all spaces were booked up through September. Demand in 2008 is higher than in 2005, and we do not expect it to decrease. WE RECOMMEND YOU BOOK FOUR MONTHS IN ADVANCE. 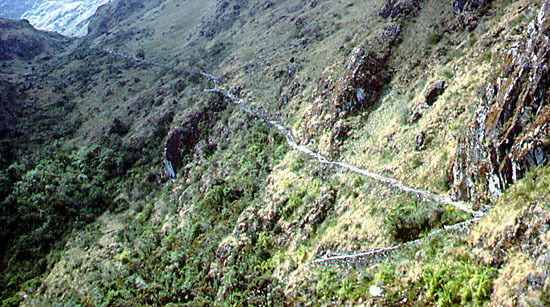 NOTE: NO ONE IS ALLOWED TO TREK THE INKA TRAIL INDEPENDENTLY. YOU MUST HAVE A GUIDE AND YOU MUST USE PORTERS. PORTERS CANNOT BE ASKED TO CARRY OVER 20 KILOS (44 LBS) TOTAL. PACK LIGHT FOR THE TREK! THERE IS A WEIGHT LIMIT FOR YOUR PERSONAL GEAR TO BE CARRIED BY THE PORTERS. THE LIMIT IS 8 KILOS (20 LBS) PER PERSON. FOR ANYTHING OVER THIS WEIGHT YOU HAVE TO CARRY YOURSELF! Backpack: full-size backpack needed only if you are carrying in excess of 8 kilos gear weight; if your gear is under 8 kilos, then you only need a daypack. Tent, sleeping bag and compact sleeping mat. Note: The trekking agency in charge of your Inka Trail trek will probably provide most of this equipment. But you need to check with them to be certain what they provide vis-a-vis what you need to bring. Some trekkers prefer to bring their own sleeping bags. Accordingly, some agencies, such as Explorandes, provide the tents and sleeping pads, but will also rent sleeping bags with clean liners. Clothing you can layer for different temperatures at different altitudes: two-piece polypro longjohns are good; an alpaca sweater for an outer layer is good. One complete change of clothing so you can get into dry clothes if what you are wearing gets soaked. Light-weight raingear; if jacket can double as a windbreaker, this is doubly good. Light-weight, but good quality hiking boots that provide ankle support. Cap or hat with brim for sun protection; sunglasses; strong sunblock. Multipurpose knife, flashlight and extra batteries, matches. Water bottle and water purifying kit. Towel and necessary toiletries, including toilet paper. Bug repellent (you may never use it, but if you do need it you'll sure be sorry not to have it). Camera and lots of film. If you are not traveling with an organized group with porters and cook, you will have to carry all your own food and cookgear. Peruvian climate features two seasons: dry season (May-Sept.) and wet season (Oct.-April). 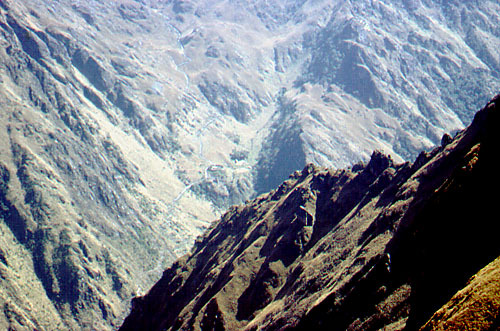 In the dry season the high Andean countryside is characterized by sere brown, gold, and tan colors, overarched by clear blue skies and puffy white clouds. While there is some rain in the dry season, it is not generally enough to impede hiking or road transport. The wet season is warmer, and the mountainsides are a fantastic variety of verdant shades; flowers abound. 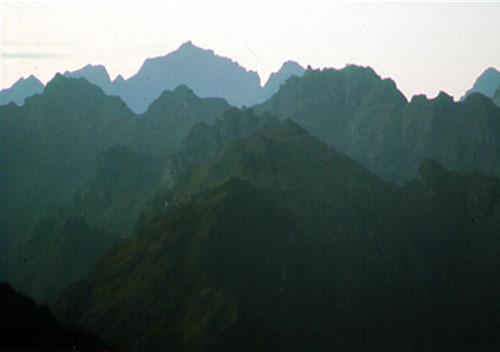 But the skies tend to be overcast, misty, and sweeping views of the ranges may be hard to find. 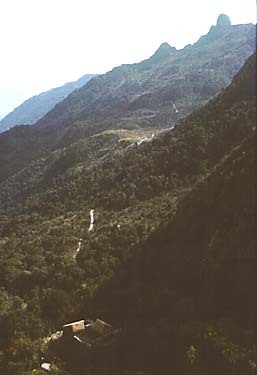 Rainfall can be heavy and abundant, causing landslides that impede travel on mountain roads and railroads; flights are commonly delayed by weather. Trekking in the mountains (and canoeing on Andean or jungle rivers) during the wet season is generally less enjoyable than in the dry, though much depends on your luck with the weather on the particular days you are hiking. For the Inka Trail, May might be the best month-- at the end of the wet season, when the rains have quit, the skies are clear and views are great, but everything is still bright and green. The disadvantage of going in the best weather months is that this is precisely when traffic is highest on the trail. The advantages of the wet season include fewer other trekkers to share the trail with, and, naturally, water is easier to find! Group size may not exceed 16 visitors, with a support crew of 22, for a total of 38 persons. 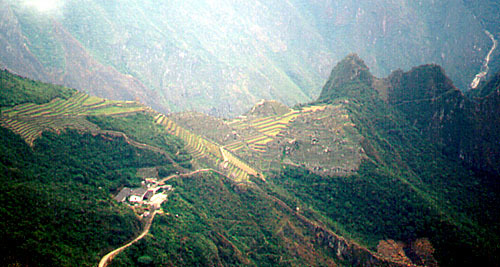 Groups may not stay more than four nights on that portion of the Inca Trail that lies within the Machu Picchu sanctuary. The trail will be closed one month each year for maintenance (January or February). Hope you enjoyed the photos and description of the Inka Trail, and find the information both inspirational and useful. Would you like to hike the Inka Trail? 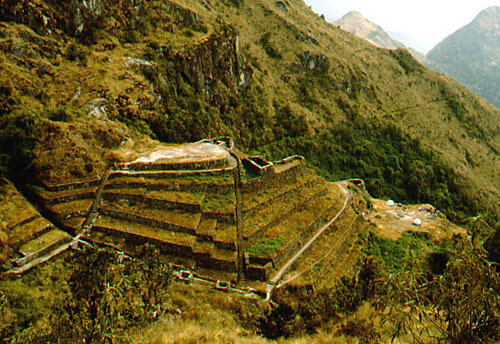 If so, click here: Inca Trail and other Peru treks. To see guided trips and other travel services offered by Rutahsa Adventures, visit our homepage: Rutahsa Adventures. Comments and enquiries can be sent to rfinch@tntech.edu. For a wonderful, information-filled site on the Inka Trail and other aspects of Peruvian culture, visit Roy Davies' Inka Trail website.